The Kolkata Knight Riders and Chennai Super Kings locked horns today at the IPL 2019. It was Imran Tahir’s four wickets and Ravindra Jadeja’s 31 runs that helped the Yellow Army register their seventh in the Indian Premier League 12. After winning the toss, MS Dhoni and men went on to bowl first. Chris Lynn guided the team to a score of 161 runs as he scored 82 runs from 51 balls. Lynn brought up his 1000 runs with a four. Titbits from others helped a team reach a total of 161 runs. Imran Tahir played a vital role as he snapped important wickets of Chris Lynn, Nitish Rana, Robin Uthappa and Andre Russell. 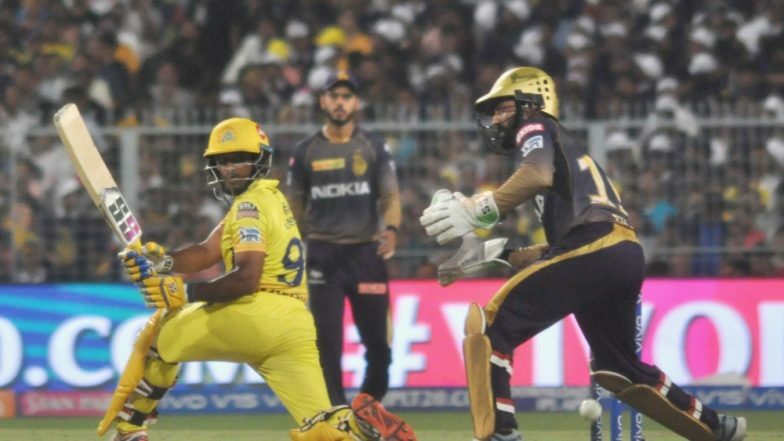 KKR vs CSK, IPL 2019: Chennai Super Kings Beat Kolkata Knight Riders by 5 Wickets. Chennai Super Kings did not have a dream start as they lost a couple of wickets in the first power play itself. Shane Watson made 6 and Faf du Plessis scored 24 runs. Suresh Raina played quite an important role as he stood tall with wickets falling from another end. Raina scored 58 runs from 42 balls and remained not out. Ambati Rayudu made 5, Jadhav made 20 and CSK skipper MS Dhoni made, 16. In the end, it was Ravindra Jadeja who slammed three fours when Chennai Super Kings required 24 runs from 12 balls to win the match. At the end of the last over, Chennai Super Kings won the game with a couple of balls to spare. CSK beat KKR by 5 wickets | Kolkata Knight Riders vs Chennai Super Kings Live Cricket Score 29th T20 Match. Let’s check out a few stats of the match. # Chris Lynn brought up his second fifty of IPL 12. # Lynn scored his eight fifty of the Indian Premier League. # Imran Tahir registered the figured of 4/27 and claimed his second four-wicket haul in IPL. # Chennai Super Kings have lost 16 wickets in the PP - most by a team in IPL 2019. # Suresh Raina brought up his 36th IPL fifty. # Also Raina scored his first IPL 2019 fifty. # This is the 10th successive win for the chasing team in IPL 2019. Imran Tahir was made the man of the match for his terrific performance and Chennai Super Kings will next play against the Sunrisers Hyderabad on April 17, 2019, at the Rajiv Gandhi International Stadium in Hyderabad.